Our new luxury Mega Pod Glamping accommodation sleep up to 4, all overlooking the idyllic village of Notgrove. Surrounded by stunning Cotswold countryside with access to walks over the 1,500 acre private Notgrove Estate it’s the ultimate in peace and relaxation. As we know the great British weather can’t always be relied upon…..our ON SITE GAMES ROOM ensures you can keep the family occupied whatever the weather. For the big kids we have table football, table tennis and for the little ones a variety of books, toys and games to suit. Offering a unique experience our luxury glamping pods allow you to enjoy the freedom of the stunning cotswolds. set on a 1500 traditional farm estate, meet our pet goats, donkeys and alpacas, buy fresh chicken eggs for breakfast and enjoy the mapped out walks and cycle routes around the farm. Our private estate offers the perfect countryside holiday for nature lovers, walk and cycle round the private farm land and enjoy the beautiful Cotswolds. The Notgrove Estate is a 1500 acre family run working farm owned by Harry and Diana Acland. Set high up in the Cotswold Hills it has 400 acres of grassland in deep valleys and 100 acres of woodland and rolling arable fields. The farm has a mix of sheep, cattle and arable and has diversified with two horse livery yards and a holiday cottage business. In the last few years Harry and Diana have put in new foot and bridle paths and entered into a wildlife conservation scheme planting 200 acres of special plots planted with wild bird mixes, corn bunting mixes, pollen and nectar mixes for bees and beetle banks that promotes the preservation of our natural wild birds. The scenery changes with each season as does the pattern of farming; we have an abundance of lambs and calves in spring, harvest in summer, colourful autumn leaves and dramatic winters, often with snow. The village of Notgrove consists of only 30 cottages, the Manor and the parish Church, making it wonderfully peaceful. The holiday cottages are situated in the village giving you a true feel of the village life. The other cottages are rented out to tenants, many of whom work on the Estate helping with the farm, Estate maintenance and the holiday cottages. The neighbouring village of Cold Aston (1 mile walk) has a wonderful country pub The Plough Inn which has just been refurbished and offers great food and ales. Nestled in an ideal location to visit many of the Cotswolds most popular towns, villages and attractions. Notgrove is a mere 3 miles from the beautiful Bourton-on-the-Water and the market town of Northleach and just a twenty minute drive from Burford and Cheltenham. With Adam Henson’s Cotswold Farm Park just along the road and The Wild Life Park at Burford we have plenty to keep the kids entertained. Our accomodation offers more than just a place to stay, with 1500 acres of beautiful Cotswold countryside to explore, mapped walks and cycle routes and a host of added extras we aim to give you a true holiday experience. Enjoy fresh eggs for your breakfast laid by Notgroves resident chickens, meet the alpacas, and have a cuddle with the donkeys and goats. Our animals love to be fed and fussed by our guests and we insist that everyone meets them during their stay. We have mapped out farm walks and the best cycle routes, we can have bicycles waiting for you when you arrive and walking/cycle maps are included in the cottage welcome packs. We also have a tennis court for hire and can arrange horse-riding, fishing and clay pigeon shooting prior to your stay. In the barns we can organise a dinner party or a beautician to make your stay a little more unique. Sitting in a private estate in the stunning Cotswolds we have a unique farm experience perfect for those who want a laid back holiday enjoying time together as a group or the get out into the countryside. Our accommodation can be rented alone sleeping just 2 in a pod, or as a groups in pods or cottages, or as a whole for a wedding party sleeping 60 in total. Whatever your group size we can try to find the perfect fit for you. Outside we have our animals who love to be fed and petted by our smaller guests. The children can collect eggs from the chickens, feed the alpaca and donkeys and play with our nutty goats. Peppa our holiday cottage dog is always ready for a cuddle or ball game and is super friendly. We have two onsite games room - one for the pods and one for the cottage/barns offering a great place for adults and children alike. With table tennis and table football (mini pool in the cottage games room) books, games and flat screen TV these offer a great extra space. Our mini football pitch, undercover toddler play hut and woodland are offer safe places for the kids to play and enjoy the outdoors. Notgrove is a working farm, during your stay you will see the various stages of farming through the seasons. In spring we have lambs hopping around the fields, September is harvest time with the combines busy collecting in the crops, autumn is a stunning time on Notgrove with the trees changing colour and winter brings crisp frosts and maybe some snow! With just 32 cottages in the village Notgrove is very peaceful, we are also fairly remote with the nearest town being 3.5 miles away. Built in kitchenete with a microwave, mini fridge, sink with hot and cold water, kettle, toaster and a table top plug in hob. Table football, table tennis, books, board games. The pod was perfect, everything we needed, will recommend and use again. Thanks so much for your review, so glad you enjoyed your stay with us. I enjoyed my stay but there were a few drawbacks, the mattress was very uncomfortable and my back suffered, no cups no plates or pots I don’t mind the bedding but please provide the bare essentials to save taking my kitchen on holiday. Stunning location and completely relaxing. Had the most wonderful weekend staying in a pod. 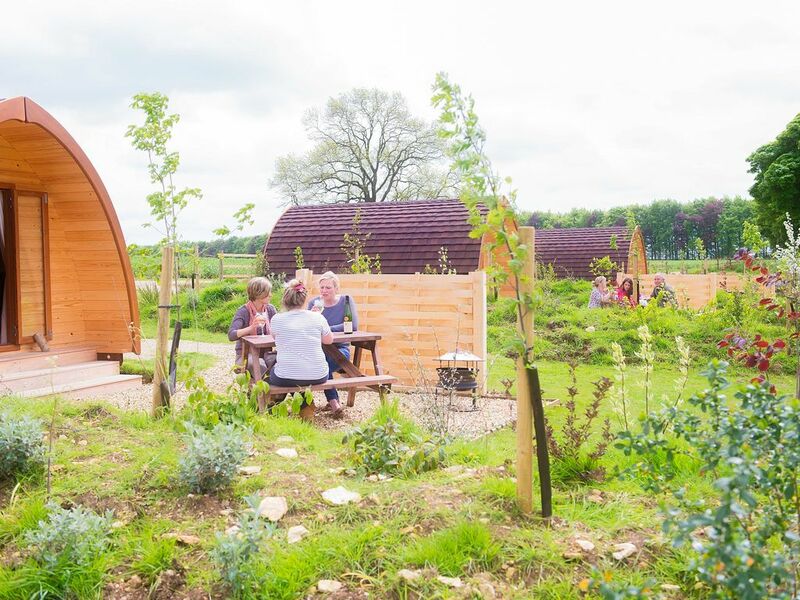 The pods are brilliant and perfect for a weekend trip. The location was utterly relaxing with beautiful views. We spent most of our time walking to local villages! I would highly recommend. Thank you so much for your lovely review, I am so glad you enjoyed your stay with us. Beautiful little pods. Amazing and has everything you need. Absolutely loved it. Everything you need is to hand. As we went in November it was cold but a little blow heater made all the difference. A portable radiator was provided which kept the pod at a great temperature throughout our stay. The animals on your door stop is a nice edition as well as the little games room a few steps away. Not grove has a lot to offer but most of all it’s in an ideal little location which is perfect if you want to see as much as you can in a weekend. Thank you so much for your lovely review, it really does mean a lot to us. So glad you enjoyed your stay and that the pod was nice and warm 😊 hope to see you again. We really enjoyed our weekend away here. The pods are nice and cosy and would visit again. Thank you so much for your review, we'd love to see you again! Lovely pods with a shower, a loo and lashings of hot water too! Lovely for two bit squashed for two + two. We're booking again for Easter, no, us two aren't mad! Thank you so much for your lovely review - look forward to seeing you again at Easter. Our property prices vary depending on your group size and season so please get in touch to discuss your options.